In the early 1960’s, Anna and Umberto Stasi decided to turn their natural hosting vocation into a job. Over the years, the Stasi family expanded its passion for the hospitality sector, even going so far as to establish the “Siena Inns” Group, which at present is made up of the Hotel Garden, the Hotel Italia, the Agriturismo Villa Agostoli and the Relais degli Angeli. The family’s natural passion for meeting and welcoming new people and for conveying the values of Tuscany’s culture was transformed over time into a solid professional tradition, handed down generation after generation by the Stasi family. Today it is Luisa, assisted by her three daughters, who carries on the family’s mission, which consists in making the stay of the guests who choose the hotel facilities of the “Siena Inns” group for their holidays in Siena an unforgettable experience. 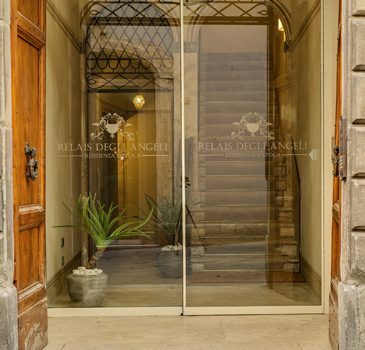 The “Relais degli Angeli” completes the range of hotel facilities. It is located inside the same palace where Umberto Stasi was born in 1927. Overlooking Via Montanini, one of the main roads of Siena’s old town centre, the palace has always played a central role in the city’s historic affairs. The building features a beautiful large terrace that offers a view of the Church of San Domenico and of the Fortress, which provides the background for the gardens of La Lizza. The spacious terrace is where our guests enjoy their breakfast, but it can also be used during the aperitif hour to enjoy a drink and a beautiful sunset.